This addon provides a status panel with useful information for Asylum Sanctorium, mostly for Olms +1 and +2 engagements. The time between his channels is variable, but there is a minimum of 12s between channels. This can be used to help identify windows where it is safe for interrupters to briefly turn their attention elsewhere. When the mini-boss is active, this timer counts up and tracks how long the boss has been active. Enragement starts when the boss has been active for 3 minutes. When the mini-boss is inactive, this timer counts down and tracks how long it will be before the mini-boss reactivates. If the mini-boss is enraged, a number will appear here showing the degree of enragement. Every 20s, enragement increases in intensity, up to a maximum of 6 stacks. After Felms' third Teleport Strike, there is a 20s cooldown before he will teleport again. This timer counts down the number of seconds remaining in this cooldown. This timer tracks the number of seconds since the last Storm the Heavens (i.e., Olms' "lightning rain") mechanic. This mechanic is scheduled to happen every 35s, but can be delayed by other mechanics that are in progress or queued. In particular, it would appear that both the steam breath and the execute-phase fire mechanics take precedence over the storm. For example, if the main tank sees that the timer is at 34s and Olms is starting a steam breath, they might call to the group, "Lightning after Olms finishes this steam breath". 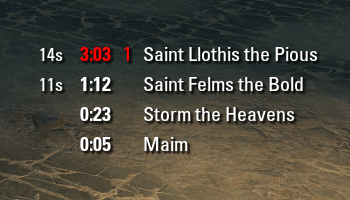 Note: During execute, the addition of the fire mechanic competing for scheduling means you will sometimes see Storm the Heavens happen as late as 50s. When a Protector is active, the timer will be white (<75s) or orange (>75s) and will count the number of seconds since the Protector's spawn. Protectors must be killed within 90s of spawning to avoid the spawning of an additional penalty Protector. After a Protector dies, the timer will turn green and will count the number of seconds since the Protector's death; the next Protector will spawn 10±2s after the previous Protector's death. Penalty Protectors are not tracked since they do not spawn additional Protectors upon death. This will appear if you are affected by Felms' Maim and will count down the number of seconds remaining. The purpose of this is to give better feedback to the player of when they are maimed, in hopes that it will make it easier for the player to learn to avoid the things that can maim them. This is a 2-part ability. Llothis will do a knockback with a 1-second cast time, followed by a 6-second channel. This notifies at the start of the 1s knockback ability. Ideally, if Llothis is interrupted during the 1s knockback ability, the 6s channel can be avoided entirely. This notifies the players who are targeted by Felms' Teleport Strike. Players who are assigned to kite the Teleport Strikes are advised to also keep an eye on the cooldown timer in the status panel. This notifies a player if they are targeted by Exhaustive Charges (i.e., "static lightning pool"). This notification differs from the notification in Raid Notifier in that this notification happens slightly later, once a target has been acquired. RN's notification will notify everyone, even if they are not targeted, because at the point RN notifies, targeting information is not yet available. Notification of when a Protector or mini-boss has spawned. Note: As of version 1.1.1, this notification is disabled by default, as it is made redundant by the new Protector timer. This addon does not yet have a setting panel UI. I do plan to add a setting panel in the future, but it's not a priority. In the meantime, users can change some settings manually using /script commands. Note: Version 1.1.2 is just a maintenance release to address some of the issues that had been reported over the past week while I was away. Boss health tracking--thanks to some suggestions from Kyoma--will be added in version 1.2.0, slated for later this week. first of all thx for this amazing addon, it's really helpful. "WARNING: Protector spawn override; please report this incident to the addon author!" This is great as usual! One question tho, might there be options to disable atleast the notifications? The on-screen notifications can now be manually disabled (via editing the SavedVariables file or by using the script commands below) in version 1.0.1. I haven't gotten around to making a UI for changing these settings--I'll do that in a future version. did you find time to make some ui updates with the notifications? Last edited by Kyoma : 11/10/17 at 09:12 AM.